Puckered Scars: The skin appears to have been pierced by a needle. Boxcar scars: They are round or oval depressions wider than ice-pick scars. They develop as a result of tissue loss from a severe breakout. They give the skin a pitted appearance. Hypertrophic scars (click to read more about hypertrophic scars): They appear as firm, raised scars and are usually larger than the original acne in size. Alma Photo Facial: is a breakthrough painless technology that stimulates collagen and decreases unwanted pigmentation thus working on acne scars and red and brown marks left by acne. 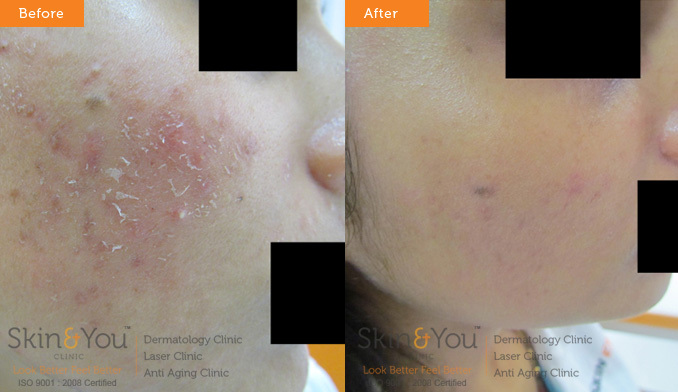 The post acne pigmentation is cleared and the scars appear smooth and resurfaced. We at skin and you specialise in acne scar treatments. We have a systematic approach to scars and understand that scars have a physical and emotional effect on the patients.